The last-lap pileup at Talladega turned out to have caused an injury after all. Dale Earnhardt Jr. revealed that he sustained a concussion during that crash, and will not be driving the No. 88 for at least the next two races. In a press conference Thursday, Earnhardt Jr. revealed that he previously sustained a concussion in a 40-G crash at the August 29th tire test at Kansas. He did not seek treatment for the injury, fearing that it would impact his Chase hopes. "When you have a concussion, the symptoms can be really mild, and then they'll typically go away after a couple days and you feel perfectly normal." Earnhardt Jr. explained. "But then when you get in a car and you go around the track at a high rate of speed, you start to understand that some things just aren't quite where they need to be and some reactions just aren't as sharp. You really can't get a measurement of that until you're in the car. You can't even ‑ there's just no way of knowing until you can drive. I wasn't willing to ‑ with the Chase coming up, I didn't know how difficult - if I was to volunteer myself to medical attention and be removed from the car, I didn't know how difficult it would be to get back in." Regan Smith, who had been slated to begin his stint with James Finch this weekend, takes the wheel in Earnhardt Jr.'s place. AJ Allmendinger, recently reinstated to NASCAR after his suspension, will drive the No. 51 for James Finch. It's not the first time Earnhardt Jr. raced while suffering the symptoms of a concussion. In April 2002 at Fontana, he hit the wall while trying to get to pit road and took what he described at the time as about as hard a hit as he'd ever had. In that crash, Earnhardt Jr was quoted as saying, "It just took every bit of air out of me. I could hear the guys on the radio, but I couldn't answer." He later revealed he'd kept quiet about the severity of his condition to avoid the kind of experience that teammate Steve Park endured after his 2001 head injury. 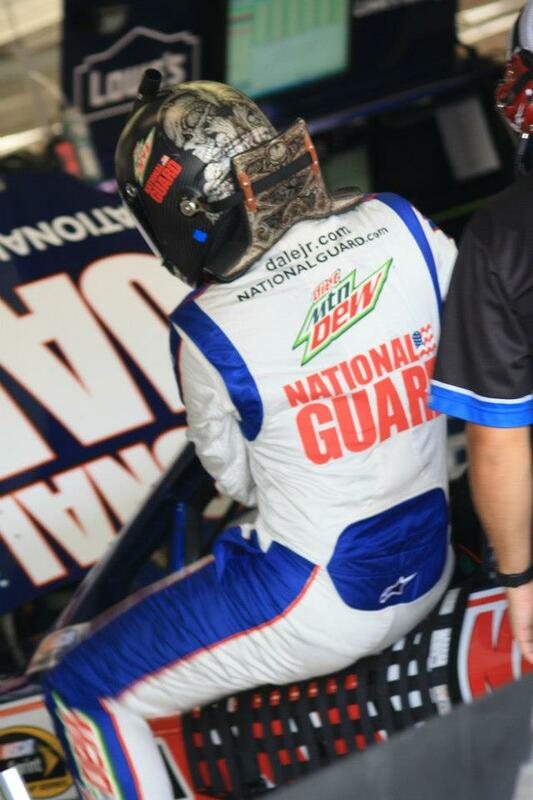 Dale Earnhardt Jr. at Atlanta Sept 1. But that was a decade ago and Earnhardt Jr.'s had other head injuries during that span that led him to conclude that perhaps he should take a different tack this time. "I thought I was in the clear, but just that little accident at Talladega, I started having headaches and stuff immediately after the wreck, and then into the next day and into Tuesday, and I thought, man, this is pretty soon after the other accident in Kansas. I should probably take this really seriously and seek some professional opinions on this." In contrast to the Kansas crash, the Talladega crash impact measured 20 Gs. Despite telling crew chief Steve Letarte on the radio "Stevie, I don't know if I can take another hit like that," Earnhardt Jr. said Thursday, "It wasn't really that big of a wreck, and the fact that I felt the way I did was what concerned me after the accident at Talladega because it wasn't that hard of a hit." He sought medical advice on Tuesday because he, "knew having them two concussions back-to-back was not a good thing. So I needed to go see somebody regardless of whether I wanted to get out of the car or not. Just for my own well‑being, I couldn't --if I didn't need to go get in a race car and get hit again, I needed somebody to tell me that because I was going to have a hard time making that decision for myself. I feel perfectly fine, but I don't want to keep getting hit in the head." Dr. Jerry Petty, the Charlotte neurosurgeon who won the Bill France NASCAR Award of Excellence in 2006, indicated that Earnhardt Jr.'s MRI showed no injury. He explained, "If an MRI scan or a CT scan is abnormal, then it's no longer a concussion, it's a hemorrhage or a contusion. By definition it's not a concussion." He went on to say "What he has is really called a diffuse axonal injury, and it's something that does not show on scans, and we don't have test that will show that other than symptoms and signs. Sometimes there will be some residual signs left over, but Dale had none of those." However, Petty noted that the main symptom that shows that the brain has not heal is a headache. "A long as there's any headache, the brain is not healed, and until that's healed and had some time to rest and then you provoke it again and can't make it happen again, then that's - then you feel like you're on the road to recovery." Dr. Petty indicated that once Earnhardt Jr. goes four or five days without a headache, "Then we'll give him some sort of test like to get his pulse rate up, see if we can provoke a headache, and then if we can't, we'll let him go out and drive a lap or two and see how that goes, and if that goes well, we'll probably clear him to race." When asked if he planned to sit out the rest of the season, Earnhardt Jr. said, "I would love to race this weekend, and I feel perfectly normal and feel like I could compete if I were allowed to compete this weekend. But I think that the basis of this whole deal is that I've had two concussions in the last four to five weeks, and you can't layer concussions. It gets extremely dangerous. So I really don't want to - I think that we could easily have chosen to do that, but I'd like to get back in the car and compete as soon as I can, as soon as the doctors feel like I'm able to do that." What Earnhardt Jr. did not do was blame the cars or the tracks. "There's just some things that you can't control," he said. "I don't know that you can have a race car that's completely 100 percent safe. But there's been so much -so many advances in the last 10 or 12 years that have made this sport incredibly safe. So I have no worries about that." Team owner Rick Hendrick applauded Earnhardt Jr's decision to seek treatment, and that "...because Kelly has been working with Regan and Junior, I called James Finch last night about 10:00 and asked him could we use Regan. He agreed, and that's -- we told Stevie last night at 8:00. So this morning he called Regan and we told him we'd had it cleared with James." Earnhardt Jr. said, "Regan doesn't need any tutoring or anything like that. He's ready to go. He's going to do a great job. I'm excited for his opportunity. He's a really good guy, been a good friend of mine for a long time. Under the circumstances I think this is a really, really neat opportunity for him, and I think that Steve and the guys will enjoy working with him." Hendrick revealed that Smith was chosen to fill in because "We've been talking about running him in the Nationwide car for a championship. 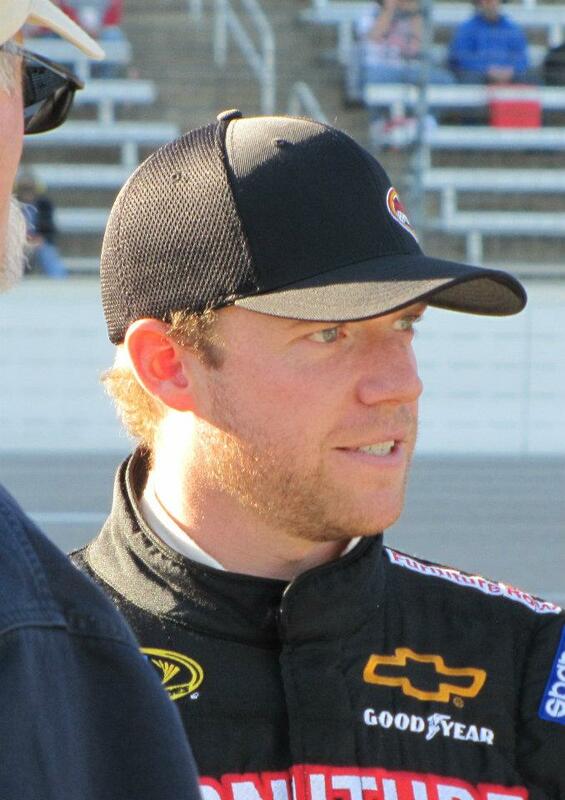 He's a good driver, and again, Dale likes him, and we're familiar with him." Crew chief Steve Letarte agreed that Smith "seems to be a remarkable talent.He's part of the Chevrolet family, which obviously helps when he comes and drives our car. We were just looking for someone that could come in and do a great job, and we feel he can, and the fact that Dale believes in him so much really made the decision that much easier." Smith, however, is focusing on the here and now. “Going beyond this weekend, and Kansas, I don’t know going forward. If Mr. H said it, usually what Mr. H says is the gospel, so we've had some talks. Certainly that would be something that would be really cool for me. But, right now the focus is the AMP Energy Chevy as far forward as we can.